Preheat grill In a bowl, combine oil, garlic, Adobo and pepper flakes. Set aside. Alternately skewer shrimp and red pepper pieces. Brush with oil mixture. Cook on grill until shrimp are opaque, about 3-5 minutes. Turn once or twice. 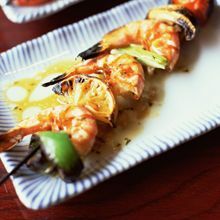 If using wooden skewers, soak in water for 10 minutes before using. Especially if you have a Shrimp on Skewers recipe.